Michael Watts (mwatts [at] calmail.berkeley.edu) directs the Center for African Studies, University of California, Berkeley. Blood may be thicker than water, but oil is thicker than both. In his 2006 State of the Union address, George Bush finally put into words what all previous presidents could not bring themselves to utter in public: addiction. The United States, he conceded, is addicted to oil—which is to say addicted to the car—and as a consequence unhealthily dependent upon Middle Eastern suppliers. What he neglected to mention was that the postSecond World War U.S. global oil acquisition strategy—a central plank of U.S. foreign policy since President Roosevelt met King Saud of Saudi Arabia and cobbled together their special relationship aboard the USS Quincy in February 1945—is in a total shambles. The pillars of that policy—Iran, Saudi Arabia, the Gulf oil states, and Venezuela—are hardly supplicant sheep within the U.S. imperial fold. With surplus capacity in OPEC at an all-time low and speculation running rampant in the commodity exchanges, Big Oil is awash with money. Corporate profits are historically unprecedented. Chevron netted a cool $14 billion in 2005, and first quarter earnings in 2006 are 50 percent higher than the previous year, a historic high obscene enough to have Congress muttering about a windfall profits tax. So-called supply risks in Iran, Venezuela, and Nigeria coupled with the speculative impulses of the oil traders have driven up the price of oil to around $70 a barrel, and a former oilman (surrounded by a posse of former oilmen) stalks the halls of the White House. As if that were not enough, the New York Times (March 27, 2006) reported that through a vague law the U.S. government will waive, for the oil supermajors, about $7 billion in state royalties over the next seven years. All of this takes us back to the 1973 oil embargo and President Nixon’s Project Independence, designed to achieve U.S. self-sufficiency by 1980. The policy failed miserably (U.S. dependency upon imported oil in the late 1960s was 20 percent and is expected to be about 66 percent by 2025) and Nixon resorted to maximizing domestic supply and turning to reliable foreign suppliers at minimal cost—just as George Bush intends to do. It is no surprise, then, that alternative sources of oil should be very much on the Bush radar screen (since conservation strategies or increased gas taxes are conspicuously absent). Cheney’s National Energy Strategy Report in 2001 bemoaned the U.S. oil habit—a dependency on foreign powers that do not have America’s interests at heart—long before the State of the Union address. A recent report in the Financial Times (March 1, 2006) makes the new agenda crystal clear. Although Africa is not as well endowed in hydrocarbons (both oil and gas) as the Gulf states, the continent is all set to balance power, and as a consequence it is the subject of fierce competition by energy companies. IHS Energy—one of the oil industry’s major consulting companies—expects African oil production, especially along the Atlantic littoral, to attract huge exploration investment contributing over 30 percent of world liquid hydrocarbon production by 2010. Over the last five years when new oilfield discoveries were scarce, one in every four barrels of new petroleum discovered outside of Northern America was found in Africa. A new scramble is in the making. 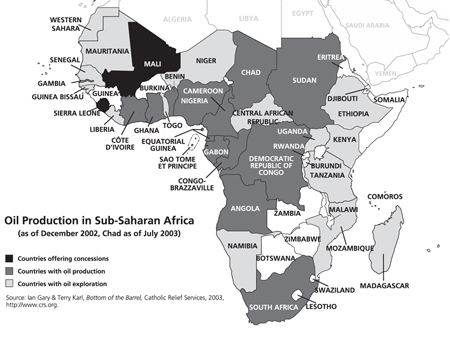 The battleground consists of the rich African oilfields (see map). Energy security is the name of the game. No surprise, then, that the Council on Foreign Relations’s call for a different U.S. approach to Africa in its new report, More than Humanitarianism (2005), turns on Africa’s growing strategic importance for U.S. policy. It is the West African Gulf of Guinea, encompassing the rich on- and offshore fields stretching from Nigeria to Angola, that represents a key plank in Bush’s alternative to the increasingly volatile and unpredictable oil-states of the Persian Gulf. Nigeria and Angola alone account for nearly four million barrels per day (almost half of Africa’s output) and U.S. oil companies alone have invested more than $40 billion in the region over the last decade (with another $30 billion expected between 2005 and 2010). Oil investment now represents over 50 percent of all foreign direct investment (FDI) in the continent (and over 60 percent of all FDI in the top four FDI recipient countries), and almost 90 percent of all cross-border mergers and acquisition activity since 2003 has been in the mining and petroleum sector. The strategic interests of the United States certainly include not only access to cheap and reliable low-sulphur oil imports, but also keeping the Chinese (for example in Sudan) and South Koreans (for example in Nigeria)—aggressive new actors in the African oil business—and Islamic terror at bay. Africa is, according to the intelligence community, the new frontier in the fight against revolutionary Islam. Energy security, it turns out, is a terrifying hybrid of the old and the new: primitive accumulation and American militarism coupled to the war on terror. The backdrop to the new scramble is the calamity of African poverty—in the language of Our Common Interest: The Report of The Commission on Africa (2005), assembled by Tony Blair and Gordon Brown, the greatest tragedy of our time. They dubbed 2005 the Year of Africa. In June of that year the Live 8 concerts drew a global audience of two billion, and a week later the G8 pledged to double aid to Africa ($25 billion by 2010) and forgive the debts of fourteen African states. African poverty had forced itself into the international limelight aided and abetted by a motley crew of humanitarians from Bono to Jeffrey Sachs to the Pope. The milestones in the growing international visibility of the African crisis include the United Nations Millennium Declaration in 2000; the Millennium Challenge Account; the President’s Emergency Plan for AIDS Relief (PEPFAR); and the African Growth And Opportunity Act, all launched by President Bush; and now, the new World Bank African Action Plan. Collectively these palliatives were belated responses to the unacceptable face over two decades of globalization, reform, and the search for the Holy Grail of good governance. On the continent itself, the New Economic Partnership for African Development [NEPAD] (2001) and the revamped African Union (formerly the Organization for African Unity) offered the prospect that poor leadership (the pathologies of the African postcolonial state variously described as patrimonialism, prebendalism, predation, quasi-statehood, the postcolony, and politics of the belly) were to be taken seriously by an African political class that purportedly represented a new sort of democratic dispensation unleashed by a raft of the political transitions during the 1990s. To see the African crisis, however, as a moral or ethical failure on the part of the international community (not least in its failure to meet the pledges promised by the Millennium Development Goals of reducing poverty by half by 2015) is only a partial truth. The real crisis of Africa is that after twenty-five years of brutal neoliberal reform, and savage World Bank structural adjustment and IMF stabilization, African development has failed catastrophically. William Easterly, former high-ranking World Bank apparatchik, in his new lacerating demolition of structural adjustment—a quarter century of economic failure and political chaos—boldly states that the entire unaccountable enterprise of planned reform is absurd (http://www.nyu.edu/fas/institute/dri/Easterly/). It was Africa after all that was the testing ground for the Hayekian counter-revolution that swept through development economics in the 1970s. It began with the publication of Accelerated Development in Sub-Saharan Africa: An Agenda for Action (known as the Berg Report), the first in a series of World Bank reports that focus on the development problems of sub-Saharan Africa. This was the first systematic attempt to take the Chicago Boys experience in post-Allende Chile and impose it on an entire continent. The ideas of Elliot Berg and his fellow travelers marked the triumph of a long march by the likes of Peter Bauer, H. G. Johnson, and Deepak Lal (ably supported by the monetarist think tanks such as the Institute of Economic Affairs and the Mont Pelerin Society, and the astonishing rise to power from the early presence of Leo Strauss and Fredrich Hayek of the Chicago School) through the development institutions like the World Bank. Long before shock therapy in Eastern Europe or even the debt-driven adjustments in Latin America, it was sub-Saharan Africa that was the playground for neoliberalism’s assault. According to the United Nations, twenty-six of thirty-two sub-Saharan states had a liberal economic regime by 1998. Almost all had experienced some sort of structural adjustment program in the wake of the Berg report. If the 1980s were Africa’s Lost Decade with collapsing commodity prices, deteriorating terms of trade, and the first crashing waves of IMF austerity—then how might one characterize the last fifteen years, in which the benefits of reform were to be finally felt, but in which life expectancy across sub-Saharan Africa steadily fell and per capita income has at best stagnated? And all of this during a period in which net official overseas development aid fell by 40 percent (from $18.7 to $10 billion). In Africa, the court of neoliberalism has been concluded, and the verdict is in. The picture is not pretty. Over the last thirty years there has been no growth in income for the average African. Life expectancy is forty-six years. Twenty-three of forty-seven sub-Saharan states have currently a GDP of less than $3 billion (ExxonMobil’s net profit in the first quarter of 2006 was $8 billion). By 2005, thirty-eight of the top fifty-nine priority countries that failed to make headway toward the Millennium Goals were sub-Saharan states, and according to the Chronic Poverty Report 200405, all sixteen of the most desperately deprived countries are located in sub-Saharan Africa. Over 300 million people live on less than $2 per day—and this is expected to rise to 400 million by 2015. One-third of the population of the continent is undernourished; stunting rates run at almost 40 percent. According to a United Nations Food and Agriculture Organization assessment in January 2006, twenty-seven countries are in need of emergency food relief. As I write, the famine in Somalia is of the order of the catastrophic food crisis that devastated the region in the mid-1980s; the nightmare in Darfur has spread to Chad with the prospects of hundreds of thousands of refugees being pushed and shoved across the greater Chad basin in a way all too familiar to the central African crisis a decade earlier. The neoliberal tsunami broke with a dreadful ferocity on African cities, and the African slum world in particular. Reform—the privatization of public utilities creating massive corporate profits and a decline in service provision, the slashing of urban services, the immiseration of many sectors of the public workforce, the collapse of manufactures and real wages, and often the disappearance of the middle class—was remorselessly anti-urban in its effects, as Mike Davis documents in Planet of Slums (Verso, 2005). As a consequence, African cities confronted the horrifying realities of an economic contraction of 25 percent per year combined with sustained population growth of up to 10 percent per annum (Zimbabwe’s urban labor market grew by 300,000 per year in the 1990s while urban employment grew by just 3 percent of that figure). In Dar es Salaam public service expenditures per capita fell by 10 percent a year in the 1980s; in Khartoum adjustment created one million new poor and urban poverty in Nigeria almost tripled between 1980 and the mid 1990s. No wonder that 85 percent of urban growth in Nairobi, Kinshasha, and Nouakchott in the 1980s and 1990s was accommodated in the slums barracks of sprawling and ungovernable cities. Everyone’s worst urban nightmare—Lagos—grew from 300,000 to 13 million in over fifty years and is expected to become part of a vast Gulf of Guinea slum of 60 million poor along a littoral corridor 600 kilometers stretching from Benin City to Accra by 2020. Black Africa will contain 332 million slum dwellers by 2015, a figure expected to double every fifteen years. The pillaging and privatization of the state—whatever its African pathologies—and the African commons is the most extraordinary spectacle of accumulation by dispossession, all made in the name of foreign assistance. The involution of the African city, notes Davis, has as its corollary not an insurgent lumpenproletariat but rather a vast political universe of Islamism and Pentecostalism. It is this occult world of invisible powers—whether populist Islam in Kano or witchcraft in Soweto—that represents the most compelling ideological legacy of neoliberal utopianism in Africa. As if to confirm the catastrophism of commentators like Robert Kaplan, the calamity that is African development ran straight into another: the HIV/AIDS epidemic. While new epidemiological data suggests that the prevalence rates and possible demographic and socio-economic impacts for much of western and northeastern Africa may have been exaggerated (Guardian, April 21, 2006), the pall that the disease has imposed on some regions is incontestable. The impact of HIV/AIDS—with an 8 percent adult prevalence and 28 million infected, Africa accounts for 2.3 million AIDS deaths per year—has transformed life expectancy in southern and eastern Africa. Twenty years ago, a male child could reasonably expect to live to sixty in Botswana; currently it is about thirty. By 2010 there will be more than 50 million orphans in Africa. Of course, there are those within the development business for whom the failure of secular nationalist development is a result not of too much neoliberalism, but not enough. The complaint here, typically from those within the free-market establishment, is that adjustment and stabilization has never really been implemented (a right-wing version of the left-wing claim that adjustment was asking African ruling classes to commit political suicide). There is, of course, some truth to this (but the cry of any failure will always be we were defeated by not going far enough). Despite the radically uneven geographical patterns of neoliberal governance and rule, the overall tendency has been to increase social inequality and expose the poor to austerity and marginalization. And the reality is that in Africa World Bank reforms, and the pressures imposed by the WTO from the mid 1990s onwards, did have drastic consequences for trade and investment—the litmus test of neoliberal development—seen in the widespread dismantling of state marketing boards and of trade protections. And here the picture is devastating. In absolute terms African exports grew quite rapidly from 19632000, but at a much slower rate than world trade generally. Africa’s share of world exports fell from almost 6 percent in 1962 to 2 percent in 2000. In non-oil products (food and manufactures) growth rates of exports between 1980 and 1998 were miserable. It has been argued that given African conditions (income, geography, and socioeconomic conditions), the performance is average. Yet it is incontestable that African exports are characterized overall by a disintegration from Northern markets and isolation from more dynamic developments in the composition of international trade (Peter Gibbon & Stefano Ponte, Trading Down [Temple University Press, 2005], 44). UNCTAD showed that of the exports from twenty-six African states, the average concentration on primary exports has remained basically unchanged (roughly 85 percent) since 1980. In all categories, sub-Saharan Africa has failed to move up the value-added chain away from primary commodities. What is especially striking is that the fear that Africa was largely marginal to the circuits of capitalist accumulation and global resource flows during the 1980s and might be marginalized further, in some respects, proved to be a massive understatement. It is almost shocking to think that in the 1970s, Africa accounted for 25 percent of FDI to the third world. By 2000 it had crashed to 3.8 percent (Africa’s share of world FDI is currently less than 1 percent). Over the period 198185, FDI inflow into Africa was running at $1.7 billion per annum; by 199195 it had grown to $3.8 billion. Yet as a percentage of all developing country FDI inflow, the figure represented a secular decline from 9 percent to less than 5 percent (all-in-all miniscule compared to South and East Asia and Latin America). Between 1995 and 2001, FDI inflow amounted to $7 billion per year but almost two-thirds of the portfolio was destined for three countries (Angola, Nigeria, and South Africa, in which oil FDI accounted for 90 percent of all FDI inflow, see figure 3). Half of Africa’s states had effectively none. Two-thirds of FDI was derived from the same three countries (United Kingdom, Germany, and the United States) that had dominated FDI supply in 1980. According to the World Investment Report (2005), FDI into Africa is currently $18 billion; four countries account for 50 percent, and the top ten almost three-quarters. To put the matter starkly, the vast bulk of private transnational investment—the hallmark of success for the neoliberal project—was monopolized by a quartet of mining-energy economies. The remainder of the continent was essentially insignificant. From the vantage point of the Year of Africa, investment flows into the continent have been a grave disappointment. The African accumulation crisis, and the dynamics of capital and trade flows, are in practice complex and uneven. In addition to oil (and the very few cases of manufacturing growth in places like Mauritius which are little more than national export-processing platforms), the other source of economic dynamism is the (uneven) emergence of global value chains. This can be seen especially in relation to high-value agricultures (fresh fruits and vegetables) in South Africa, flowers in Kenya, green beans in Senegal. Such forms of contract production, typically buyer-driven commodity chains in which retailers exert enormous power, have created islands of agrarian capitalism that contribute to and deepen patterns of existing inequality across Africa and further the interests of business elites, which are often not African. The deepening of commodification in the countryside in tandem with demographic pressures (caused as much by civil war and displacement as high fertility regimes) has made land struggles a vivid part of the new landscape of African development. It is no surprise that against this backdrop the development establishment flails around wildly. On the one side stands former World Bank economist William Easterly for whom all aid (planning) has been a total (and unaccountable) failure. The solution is not to plan at all. Rather than planners—in his view the IMF/IBRD stenographers are really Stalinists in neoliberal garb—and the likes of Bono and Tony Blair, we need to find a raft of searchers like microcredit guru Mohammed Yunus. On the other stands the one-man industry otherwise known as Jeffrey Sachs who seeks to expand foreign aid—$30 billion a year for Africa—and to initiate a Global Compact by which the rich will help save the poor, who are as much hampered by poor physical geography as governance failure. In reality what is on offer is an even bleaker world of military neoliberalism. At one pole are enclaves of often militarily fortified accumulation (of which the oil complex is the paradigmatic case) and the violent, sometimes chaotic, markets so graphically depicted in the documentary film Darwin’s Nightmare. At the other pole are the black holes of recession, withdrawal, and uneven commodification. These complex trajectories of accumulation are dominated at this moment by the centrality of extraction and a return to primary commodity production. Currently Africa is the center of a major oil boom, an index of the centrality of the primary commodities sector as the most important source of capitalist accumulation on the continent. The continent accounts for roughly 10 percent of world oil output and 9.3 percent of known reserves. Though oil fields in Africa are generally smaller and deeper than the Middle East—and production costs are accordingly 34 times higher—African crude is generally low in sulfur and attractive to U.S. importers. As a commercial producer of petroleum, Africa arrived, however, rather late to the hydrocarbon age. Oil production in Africa began in Egypt in 1910 and only in earnest in Libya and Algeria (under French and Italian auspices) in the 1930s and 1940s. Now there are twelve major oil producers in Africa—members of the African Petroleum Producers Association—dominated, in rank order of output, by Nigeria, Algeria, Libya, and Angola which collectively account for 85 percent of African output. All of the major African oil producers are highly oil-dependent. Among the top six African oil states, petroleum accounts for 7595 percent of all oil export revenues, 3040 percent of GDP, and 5080 percent of all government revenues. Up until the 1970s North Africa dominated production of oil and gas on the continent, but in the last three decades it has moved decisively to the Gulf of Guinea encompassing the rich on and offshore fields stretching from Nigeria to Angola. The Gulf—constituted by the so-called West African Gulf States—has emerged as the predominant African supplier to an increasingly tight and volatile world oil market. The Washington D.C. think tanks and the phalanxes of oil lobbyists are deeply concerned with Gulf of Guinea security, U.S. interests, and U.S. engagement there. Gabon and Equatorial Guinea are the only African oil producers with high oil per capita (so-called petroleum endowments), comparable to the oil rich and sparsely populated states such as Kuwait and Qatar. Only Nigeria ranks within the world’s top fifteen oil producers. Nigeria, Algeria, and Libya are respectively the world’s eighth, tenth, and twelfth largest oil exporters. These three states and Gabon are all members of OPEC. All African governments have organized their oil sectors through state oil companies that have some forms of collaborative venture with the major transnational oil companies (customarily operated through oil leases and joint memoranda of understanding). In general the international oil companies operating in Africa have production share arrangements with state oil companies (Nigeria is the exception which operates largely through joint ventures). African governments guarantee the companies a minimum profit according to geological, technological, and investment criteria. The national company pays royalties for the quantity of crude produced after deductions are made to cover the costs of operations. All of these petro-states are marked by the so-called resource curse: staggering corruption, authoritarian rule, and miserable economic performance (see Ian Gary & Terry Karl, Bottom of the Barrel, Catholic Relief Services, 2003). The deadly operations of the alliance between corporate oil and autocratic oil states have helped force the question of transparency of oil operations onto the international agenda. Tony Blair’s Extractive Industries Transparency Initiative, the IMF’s Oil Diagnostic program, and the Soros Foundation’s Revenue Watch are all voluntary regulatory efforts to provide a veneer of respectability to a rank and turbulent industry. Nigeria is the jewel in the African oil crown. Nobody would doubt the strategic significance of contemporary Nigeria. One of every five Africans is a Nigerian—the country’s population is currently estimated to be 137 million—and it is the world’s seventh largest exporter of petroleum providing the U.S. market with roughly 8 percent of its imports. A longtime member of OPEC, Nigeria is an archetypical oil nation. With reserves estimated at close to forty billion barrels, oil accounted in 2004 for 80 percent of government revenues, 90 percent of foreign exchange earnings, 96 percent of export revenues according to the IMF, and almost half of GDP. Crude oil production runs currently at more than 2.1 million barrels per day valued at more than $20 billion at 2004 prices. Mostly lifted onshore from about 250 fields dotted across the Niger Delta, Nigeria’s oil sector now represents a vast domestic industrial infrastructure: more than three hundred oil fields, 5,284 wells, 7,000 kilometers of pipelines, ten export terminals, 275 flow stations, ten gas plants, four refineries, and a massive liquefied natural gas (LNG) project (in Bonny and Brass). The rise of Nigeria as a strategic player in the world of oil geopolitics has been dramatic and has occurred largely in the wake of the civil war that ended in 1970. In the late 1950s petroleum products were insignificant, amounting to less than 2 percent of total exports. Between 1960 and 1973 oil output exploded from just over 5 million to over 600 million barrels. Government oil-revenues in turn accelerated from 66 million naira in 1970 to over 10 billion in 1980. A multi-billion dollar oil industry has, however, proved to be a little more than a nightmare (Nigeria: Want in the Midst of Plenty, Africa Report 113, International Crisis Group, 2006). To inventory the achievements of Nigerian oil development is a salutary exercise: 85 percent of oil revenues accrue to 1 percent of the population; of $400 billion in revenues, perhaps $100 billion have simply gone missing since 1970. The anti-corruption chief Nuhu Ribadu, claimed that in 2003, 70 percent of the country’s oil wealth was stolen or wasted; by 2005 it was only 40 percent. Over the period 19652004, income per capita fell from $250 to $212; income inequality increased markedly over the same period. Between 1970 and 2000 in Nigeria, the number of people subsisting on less than one dollar a day grew from 36 percent to more than 70 percent, from 19 million to a staggering 90 million. According to the IMF, oil did not seem to add to the standard of living and could have contributed to a decline in the standard of living (Martin & Subramanian, Addressing the Resource Curse [IMF, 2003], 4). Over the last decade GDP per capita and life expectancy have both fallen, according to World Bank estimates. What is on offer in the name of petro-development is the terrifying and catastrophic failure of secular nationalist development. It is sometimes hard to gasp the full consequences and depth of such a claim. From the vantage point of the Niger Delta—but no less from the vast slum worlds of Kano or Lagos—development and oil wealth is a cruel joke. These paradoxes and contradictions of oil are nowhere greater than on the oilfields of the Niger Delta. In the oil rich states of Bayelsa and Delta there is one doctor for every 150,000 inhabitants. Oil has wrought only poverty, state violence, and a dying ecosystem. It is no great surprise that a half century of neglect in the shadow of black gold has made for a combustible politics. All the while the democratic project initiated in 1999 appears ever more hollow. The nightmarish legacy of oil politics must be traced back to the heady boom days of the 1970s. The boom detonated a huge influx of petro-dollars and launched an ambitious (and largely autocratic) state-led modernization program. Central to the operations of the new oil economy was the emergence of an oil complex that overlaps with, but is not identical to, the petro-state. The latter is comprised of several key institutional elements: (1) a statutory monopoly over mineral exploitation, (2) a nationalized (state) oil company that operates through joint ventures with oil majors who are granted territorial concessions (blocs), (3) the security apparatuses of the state (often working in a complementary fashion with the private security forces of the companies) who ensure that costly investments are secured, (4) the oil producing communities themselves within whose customary jurisdiction the wells are located, and (5) a political mechanism by which oil revenues are distributed. The oil revenue distribution question—whether in a federal system like Nigeria or in an autocratic monarchy like Saudi Arabia—is an indispensable part of understanding the combustible politics of imperial oil. In Nigeria there are four key distribution mechanisms: the federal account (rents appropriated directly by the federal state); a state derivation principle (the right of each state to a proportion of the taxes that its inhabitants are assumed to have contributed to the federal exchequer); the federation account (or states joint account) which allocates revenue to the states on the basis of need, population, and other criteria; and a special grants account (which includes monies designated directly for the Niger Delta, for example through the notoriously corrupt Niger Delta Development Commission). Over time the derivation revenues have fallen (and thereby revenues directly controlled by the oil-rich Niger Delta states have shriveled) and the states joint account has grown vastly. In short, there has been a process of radical fiscal centralism in which the oil-producing states (composed of ethnic minorities) have lost and the non-oil producing ethnic majorities have gained—by fair means or foul. Overlaid upon the Nigerian petro-state is, in turn, a volatile mix of forces that give shape to the oil complex. First, the geo-strategic interest in oil means that military and other forces are part of the local oil complex. Second, local and global civil society enters into the oil complex either through transnational advocacy groups concerned with human rights and the transparency of the entire oil sector, or through local social movements and NGOs fighting over the consequences of the oil industry and the accountability of the petro-state. Third, the transnational oil business—the majors, the independents, and the vast service industry—are actively involved in the process of local development through community development, corporate social responsibility and stakeholder inclusion. Fourth, the inevitable struggle over oil wealth—who controls and owns it, who has rights over it, and how the wealth is to be deployed and used—inserts a panoply of local political forces (ethnic militias, paramilitaries, separatist movements, and so on) into the operations of the oil complex (the conditions in Colombia are an exemplary case). In some circumstances oil operations are the object of civil wars. Fifth, multilateral development agencies (the IMF and the IBRD) and financial corporations like the export credit agencies appear as key brokers in the construction and expansion of the energy sectors in oil-producing states (and latterly the multilaterals are pressured to become the enforcers of transparency among governments and oil companies). And not least, there is the relationship between oil and the shady world of drugs, illicit wealth (oil theft for example), mercenaries, and the black economy. The oil complex is a sort of corporate enclave economy but also a center of political and economic calculation that can only be understood through the operation of a set of local, national, and transnational forces that can be dubbed as imperial oil. The struggle for resource control that has taken center stage over the last decade in Nigeria as the Niger Delta has become more ungovernable (because the struggle has assumed a more militant cast) grows precisely from this mix of forces that constitute the oil complex. On this canvas of African oil security and the conspicuous failure of postwar U.S. petro-policy, recent events in Nigeria—and most especially in the oil-producing Niger Delta—have necessarily grabbed the headlines (and the attention of the oil markets). The fragility of Nigeria’s oil economy was thrown into dramatic relief by the walkout by political representatives from the oil-producing region from a national meeting on the distribution of oil revenues; the arrest of a Delta militant and insurgency leader on treason charges in late 2005; and a major escalation in violent attacks on oil installations in December 2005 and JanuaryFebruary 2006 by Ijaw militants that included the taking of hostages by a largely unknown militant group, the Movement for the Emancipation of the Niger Delta (MEND). By early 2006, 630,000 barrels per day were compromised by political instability and attacks. But this turbulence must itself be placed on a larger historical landscape. Since the late 1990s, there has been a very substantial escalation of violence across the delta oil fields, accompanied by major attacks on oil facilities. Civil violence among and between oil producing communities and the state security forces is endemic (it is estimated that more than one thousand people die each year from oil-related violence). Over the last decade, the Niger Delta has been wracked by insurrection. An industry analysis prepared for the Nigerian National Petroleum Company (NNPC) and published in 2003 was entitled Back from the Brink. It painted a gloomy risk audit for Big Oil. A leaked report by Shell in the same year explicitly stated that their license to operate in Nigeria was in question. And with good reason. The NNPC estimated that between 1998 and 2003, there were 400 vandalizations on company facilities each year (581 between January and September 2004), and oil losses amounted to $1 billion annually. The tactics and repertoires deployed against the companies have been various: demonstrations and blockades against oil facilities; occupations of flow stations and platforms; sabotage of pipelines; oil bunkering, or theft (from hot-tapping fuel lines to large-scale appropriation of crude from flow stations); litigation against the companies; hostage taking; and strikes. A large group of Ijaw women that occupied the Chevron oil refineries near Warri in 2002, demanding company investments and jobs for indigenes (New York Times, August 13, 2002), reflected the tip of a vast political iceberg. Mounting communal violence in the following year resulted in many deaths and widespread community destruction and dislocation around the Warri petroleum complex. Seven oil company employees were killed in March 2003, prompting all the major oil companies to withdraw staff, close down operations, and reduce output by more than 750,000 barrels per day (40 percent of national output). These events in turn provoked President Obasanjo to dispatch a large troop deployment to the oil-producing creeks. Ijaw militants, struggling to get a cut of the illegal oil bunkering trade (some estimates suggest that this innovative form of oil theft siphons a staggering 15 percent of national production), threatened to destroy eleven captured oil installations. In April 2004, another wave of violence erupted around oil installations (at the end of April, Shell lost production of up to 370,000 barrels per day, largely in the western delta), this time amid the presence of armed insurgencies, specifically two ethnic militias led by Ateke Tom (the Niger Delta Vigilante) and Alhaji Asari (the Niger Delta People’s Volunteer Force). Each of these were driven, and partly funded, by oil monies and highly organized oil theft. Ten years after the hanging of Ken Saro-Wiwa and the militarization of the Ogoni oilfields little has changed. Conditions across the oilfields remain the same, only worse. Security forces still operate with impunity, the government has failed to protect communities in oil producing areas while providing security to the oil industry, and the oil companies themselves bear a share of the responsibility for the appalling misery and the political instability across the region. The new violence and instability is something of a watershed however. Among MEND’s demands were the release of two Ijaw leaders of note, the Ijaw being the largest and most militant minority group in the Nigerian Delta. On January 29, 2006, these hostages were released unharmed although the Ijaw leaders in question remained under arrest in Abuja, the Nigerian capital. By the first week in February MEND was calling for the international community to evacuate from the Niger Delta by February 12, or face violent attacks. Two weeks later MEND claimed responsibility for attacking a federal naval vessel and for the kidnapping of nine workers employed by the oil servicing company Willbros, apparently in retaliation for an attack by the Nigerian military on a community in the western delta. The Nigerian government claimed they had attacked barges involved in the contraband oil trade. MEND’s stated goal was to cut Nigerian output by 30 percent. Within the first three months of 2006, $1 billion in oil revenues had been lost; and twenty-nine Nigerian soldiers had been killed in the uprising and as I write, forty hostages were taken from an AGIP flow station in Bayelsa State. The situation across the oil fields is now as fraught as at any time since the end of the civil war in 1970. By late July 2006 oil production had been cut by 700,000 barrels per day (see The Swamps of Insurgency: Nigeria’s Delta Unrest, Africa Report 115, International Crisis Group, 2006). The current crisis points to the fact that the oil-producing region in Nigeria now stands at the center of Nigerian politics—for four reasons. First, the efforts led by a number of Niger Delta states for resource control expanded access to and control over oil and oil revenues. Second, there was the struggle for self-determination of minority peoples in the region and the clamor for a sovereign national conference to rewrite the constitutional basis of the federation itself. Third, there is a crisis of rule in the region as a number of state and local governments are rendered helpless by militant youth movements, growing insecurity, and ugly intra-community, inter-ethnic, and state violence which—as the recent events point out—can threaten the flow of oil and the much vaunted energy security of the United States. And not least, there is the emergence of a so-called South-South Alliance making for a powerful coalition of small and hitherto politically marginalized oil producing states (Akwa Ibom, Bayelsa, Cross River, Delta, Ondo, and Rivers) capable of challenging the ruling ethnic majorities (the Hausa, the Yoruba, and the Ibo) in the run-up to the 2007 elections. The availability of arms to both government and insurgent groups has democratized the access to the means of violence in the struggle for political power. In the run-up to the 2007 elections the windfall oil revenues will, as in 1999 and 2003, fund all manner of political thuggery and the arming of political parties and local militants who will be expected to deliver votes and intimidate voters. The prospect of U.S. militarization in the south to protect the oil fields, and in the north to control Islamic terror through the Pan Sahel Counter Terror Initiative, is a recipe for massive political violence. Nigeria provides, in this sense, a microcosm of the new scramble for Africa under military neoliberalism and the war on terror. It might well be the next Iraq.